Bit of a long winded title, but I wanted to get it all in there. 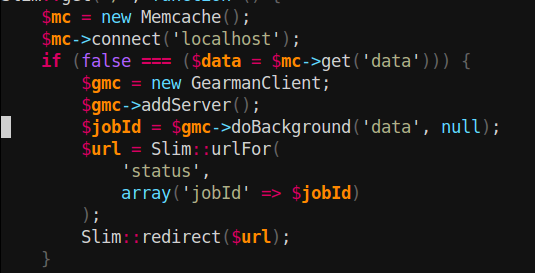 When memcache tells my application it can't find the droids it's looking for, my application now adds a background job to the gearman queue. The application then forwards the user to a job status page, complete with a progress bar courtesy of the fantastic Dojo Toolkit. The user sits and watches in eager anticipation. A gearman worker script is running on the server thanks to supervisord, it comes along picks the job from the queue and sets about fetching the data. As it progresses, it pings the gearman server about it's current status. 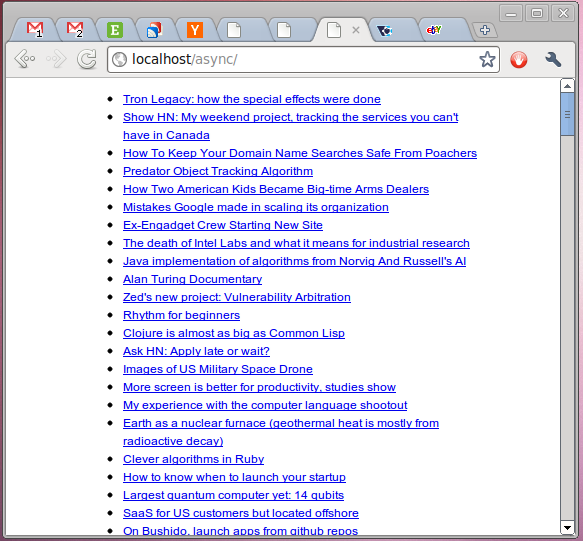 The page the user is glued to is repeatedly pinging the server to check on the progress of the job. As the job server gets updates from the worker, the web server passes them on to the user via the dijit.ProgressBar. You can browse the sample scripts at github, they're not amazing, just meant to show the method I've described here. As a side note, I wondered if anyone had come up with a Sinatra style framework for PHP, turns out there were quite a few, I chose the Slim Framework as I could see from the homepage it took PHP 5.3 lambdas, the others didn't make it too clear. Has anyone else done anything similar? Am I doing something stupid? Comments are welcome.